Home » Frequently asked questions » Notable family connections - FAQs » Are any Thrales related to royalty? So far I have discovered three English Kings to which have been distantly related to a Thrale. 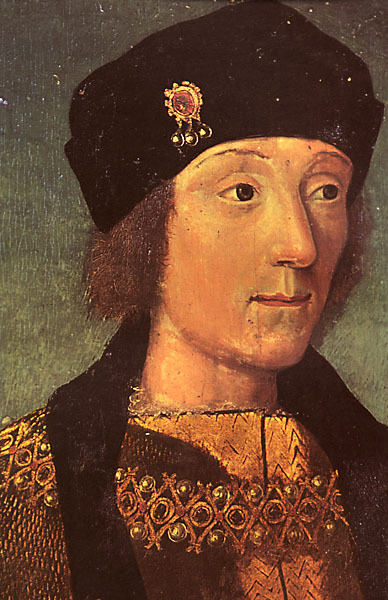 The closest is King Henry VII 1457-1509 who was Hester Thrale’s 8th great grandfather. King Henry III 12 October 1207 - 16 November 1272 was 16th great grandfather of Sophia Thrale's husband John Meredith Mostyn 1775-1807. King Edward I 17 June 1239 - 7 July 1307 was 15th great grandfather of Sophia Thrale's husband John Meredith Mostyn 1775-1807. Were people royal or what is so special about our family :-? No direct relationships that I am aware of with the royals, but Sophia Thrale married Henry Merrick Hoare (1770 - 1826) the 15th great grandson of King Edward I (1239-1307) and 16th great grandson of Henry III (1297-1272). I have posted two new images of Sophia Thrale. I have also posted an image of Sophia Thrale's mourning tablet. I don't have you or your family on the family tree, it would be great if you could tell me some about your branch of the Thrale's. Thrale.com promises never to post anything other than the names of living individuals without their permission. I have been told before by my grandmother, that the Thrale family are descendants of royalty. I have some stuff to add to the tree, but need to see a full diagram to fill in the gaps. As far as I am aware, my grandmother can trace the family tree back to approximately the 13th century, and although I cannot confirm the royal connection as we speak now, I can find out tomorrow and post then. Funny thing is, I have just seen the pictures of Sophia Thrale, and there is a family resemblance ... weird. I have noticed that the forum seems to have come to a bit of a standstill recently, and would be interested in this becoming an active forum community, so please start posting again!! I want to meet my extended family! My great uncle, David Thrale, passed away about 5 years ago, in his fifties, having been mentally handicapped with Downs Syndrome, he never married and could not continue the name. Subsequently, I have taken the name as my middle name as my children will in the future. Welcome, but more clues needed! Welcome to our little forum. I am afraid that I don't seem to have your bit of the family tree online. I was in a similar position myself, until I had posted what I knew on the thrale.com and someone in cyberspace emailed me and helped me to fill in the gaps. The best thing to do is to let me know as much detail as you know, and I will fit that into the family tree. Once we have the basics we can start filling in the gaps. I can cope with whatever format you have the info in. If you don't already have what you know written down, just sit down one day with you Gran and get her to tell you what she knows about her parents, Grand parents etc. Then type it up and email to us for inclusion. See if she will let you borrow any documents like birth and marriage certificates, or photos of passed relatives. Don't forget to add what you know starting with yourself! The names you mentioned - David, Geoffrey, Lois, Edgar - aren't known to me. Thrale.com promises to not publish anything other than the name and position in the family tree for any person thought to be alive. It will be an interesting journey when we will both learn about relatives we didn't know about and will continually add new bits of information on our family tree. I only recently found that my great grandfather had 21 children. I look forward to hearing about your bit of the family tree. Family tree for John Meredith Mostyn.